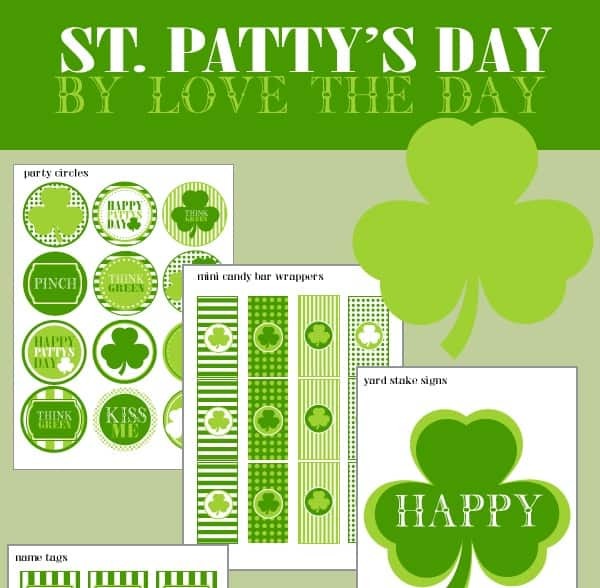 I’ve gathered some free St. Patrick’s Day printables from talented designers around the web. Planning a party for your class at school? A small celebration at home with your kids? A big Irish feast with your best pals? We have free printables for all your St. Patrick’s Day celebrations. 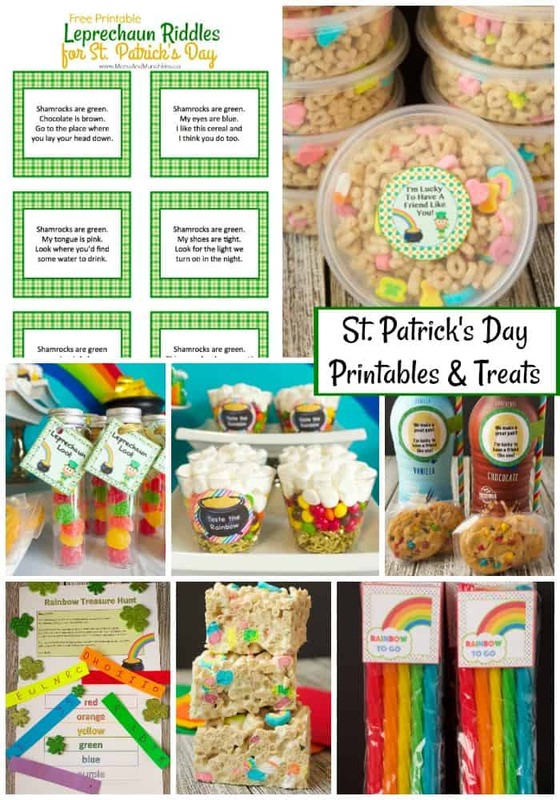 Be sure to check out our St. Patrick’s Day page loaded with ideas for your celebrations like treat bag ideas, free printables, Irish meals, desserts, activities and more. Here’s a quick sample of the printables you’ll find on that St. Patrick’s Day page. 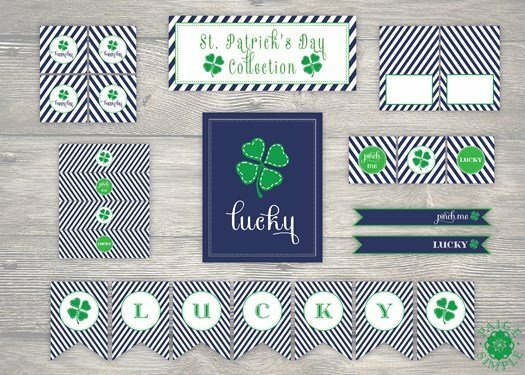 This free St. Patrick’s Day printable set by Love The Day includes all you’ll need for decorating your party including party circles, mini candy bar wrappers, yard signs, name tags, food tent cards, photo booth props and so much more. This party set is perfect for either a children’s or an adult party. 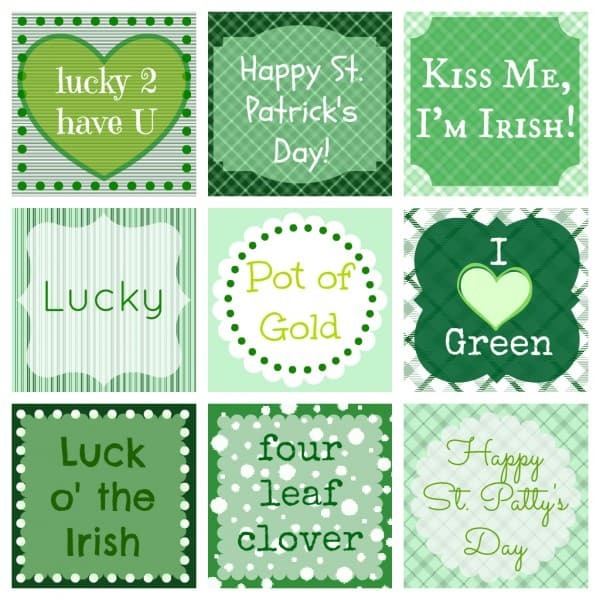 Another fun & free St. Patrick’s Day printable set is this one by Chickabug featured on How Does She. There are so many ways to use this printable set – straw flags, cupcake toppers, water bottle labels, napkin wraps, etc. 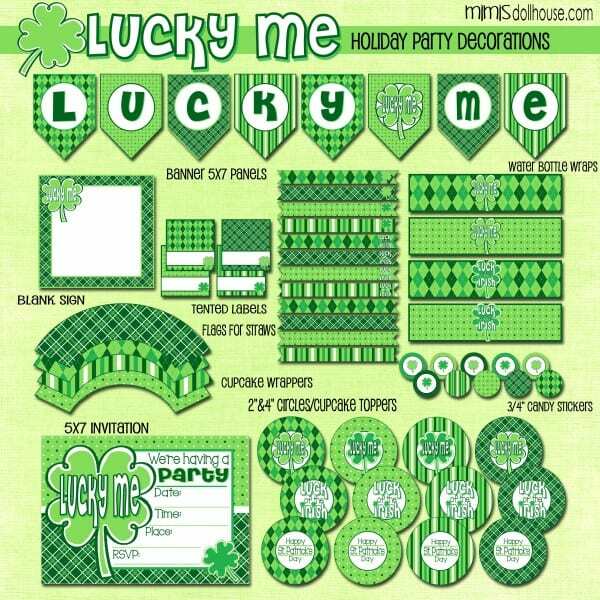 On the freebies page of Mimi’s Dollhouse you’ll find this fun Lucky Me free printable set to use for your St. Patrick’s Day party. I love this set so much that I was inspired to create my own little party with it. Visit our St. Patrick’s Day page to see more with this set! Over on We Heart Parties you’ll find this preppy set of St. Patrick’s Day printables by Paige Simple Studio. I love the “pinch me” straw flags. 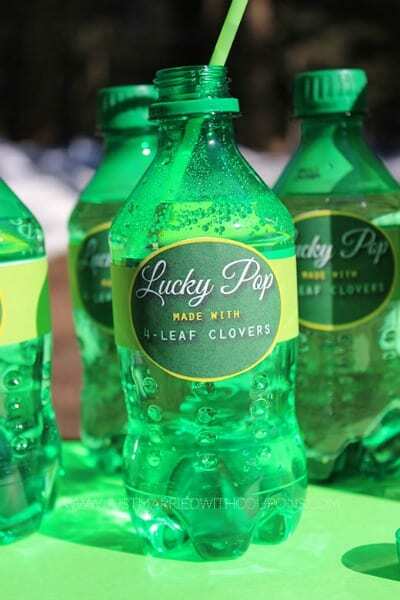 These pop bottle labels by Homemaking Hacks are so clever and can be used on some lemon lime soda bottles. 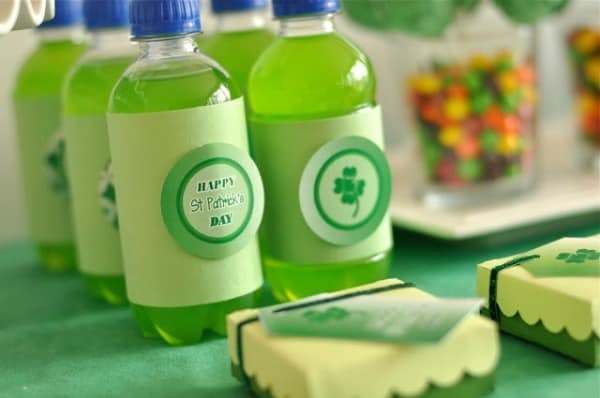 This beautiful St. Patrick’s Day Party by Creative Juice used a fun free printable St. Patrick’s Day set from Bird’s Party. 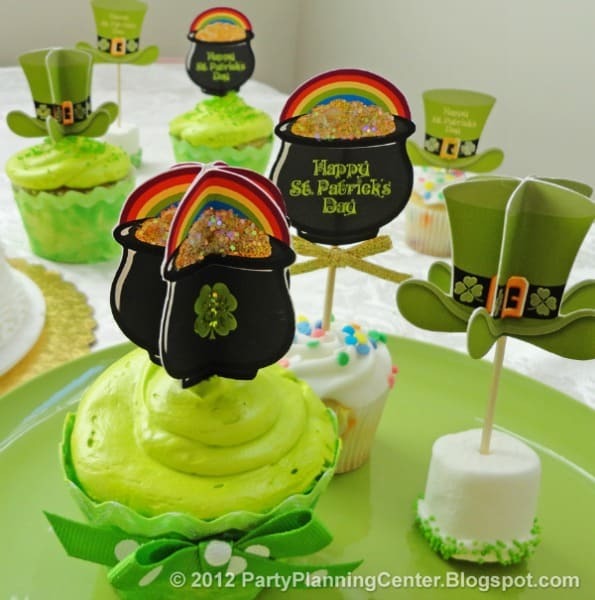 I love these 3D St. Patrick’s Day printables by the Party Planning Center. You could simply use them as double-sided as well but the 3D toppers would be so fun to top your desserts! 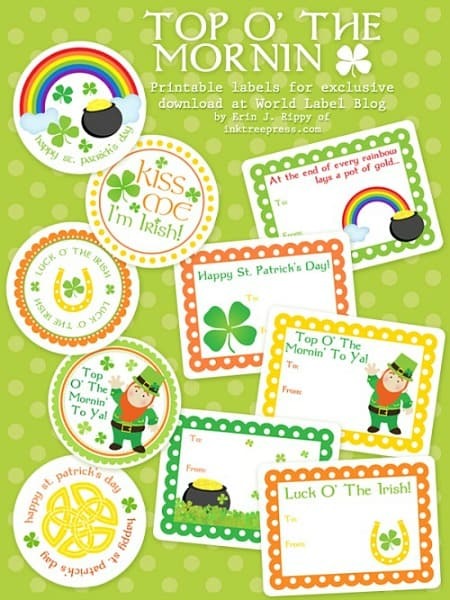 These free St. Patrick’s Day stickers and labels by World Label can be used in so many fun ways – favor tags, envelope seals and more! These printable tags from Better in Bulk could be used for treat tags, cupcake toppers and more. 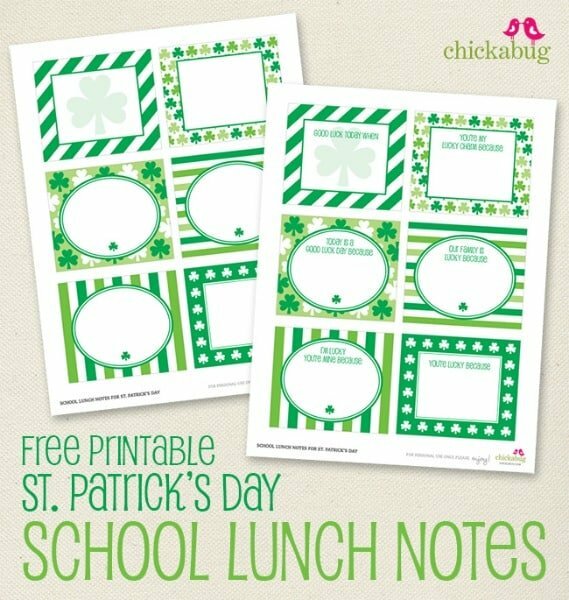 Another fun freebie by Chickabug – St. Patrick’s Day lunch notes! You can have an entire week of fun St. Patrick’s themed lunch notes leading up to your family’s celebration. 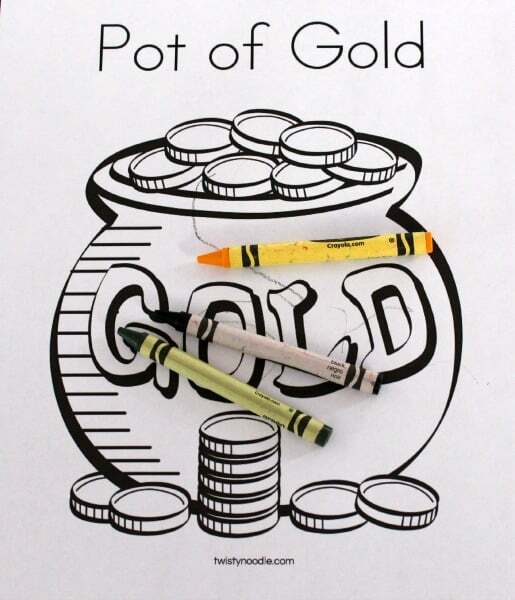 For a nice quiet activity, try this free Pot of Gold coloring page by Twisty Noodle. Visit our St. Patrick’s Day page for even more creative ideas, free printables, treats and much more! We’re always adding new ideas! Stay updated on the latest by following us on Facebook, Twitter, Pinterest, and Instagram. Thank you for sharing, Dawn! Your idea is adorable! What a great collection — and I’m not just saying that because you included my 3D toppers! These are some seriously cute printables. I love the dollar bills in particular. What a clever idea! Thank you so much for sharing, Carla! Thank you so much for the free printable. We are bummed this year that St. Patrick’s Day falls on a school day (it usually falls during our spring break). However, we decided to celebrate St. Patrick’s Day early by having a party at our house. 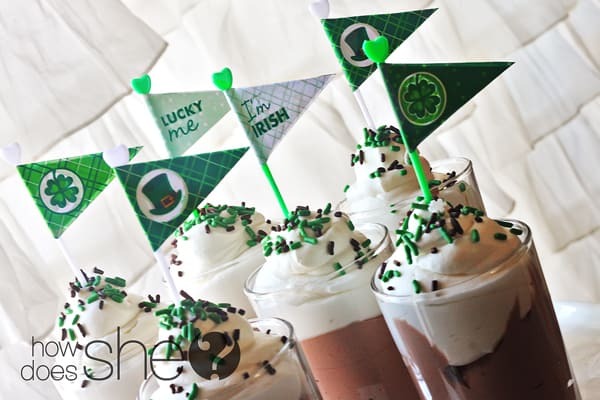 Your site has helped a great deal in helping me plan for a fun St. Patrick’s Day for our friends and their kids! Thank You! Thank you for your kind note, Shana! You’ve made my day!